Chop chocolate into small pieces and melt using a double boiler. Chop the butter into small pieces too. Once the chocolate melts completely remove it from heat and add in the butter. Mix until the butter melts and mixes up smooth with chocolate. In a mixing bowl, beat eggs and sugar until they turn light and fluffy. 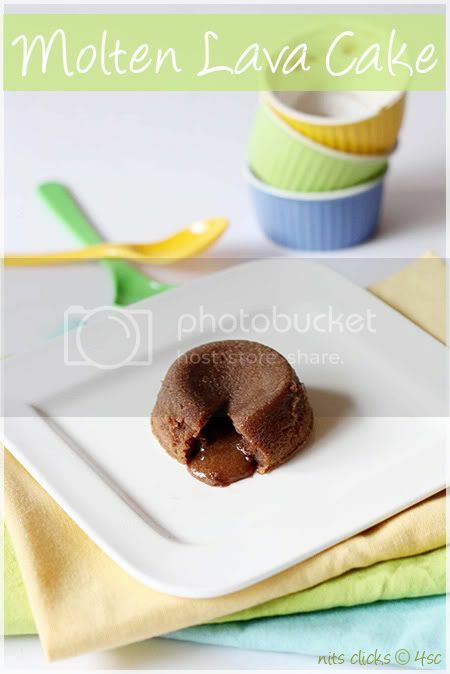 Pour in the chocolate butter mixture and all purpose flour into the eggs and whisk until well incorporated. Apply butter on the sides and bottom of the ramekins( small porcelain bowls/ moulds) and pour in the cake batter filling about 3/4th of the ramekin. Bake at 350°F or 180°C for 10 mins - 15 mins. Mine was perfect at 10 mins sharp. 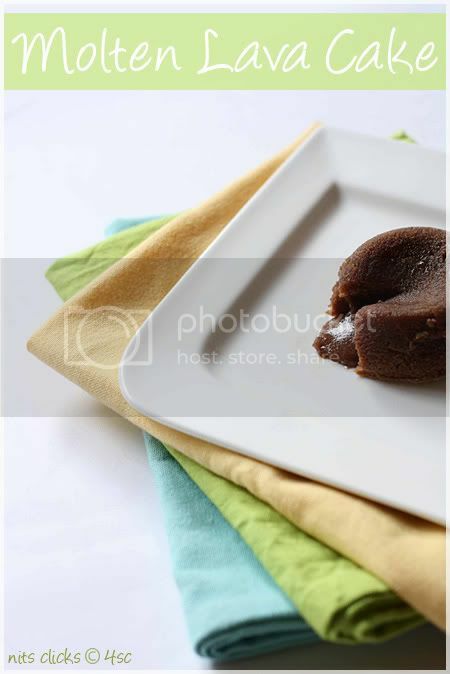 Serve the cake just after you bake for a perfect flowing chocolate lava. 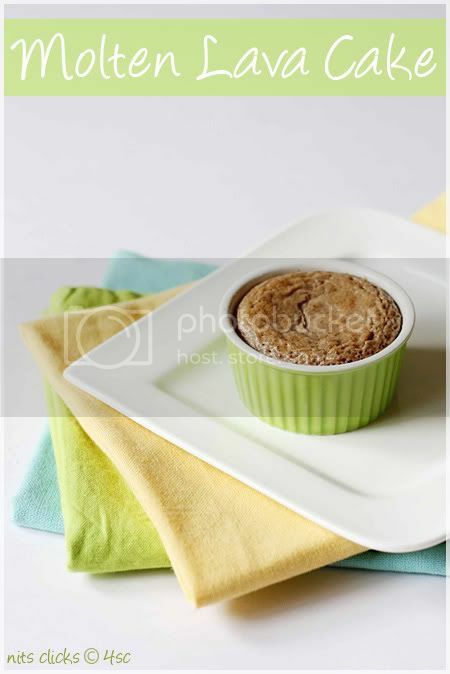 Once baked, allow the ramekins to cool down for just two mins and invert it on the serving plate. Leaving it for long in the ramekin would not give you flowing lava. 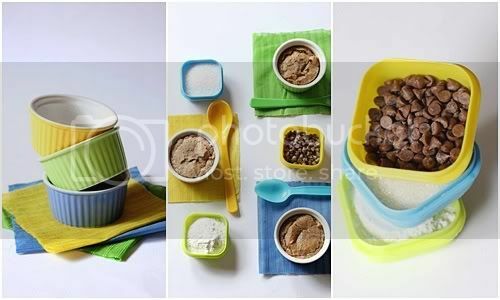 Reduce the amount of sugar to 1/4 cup if your chocolate is sweet. My first batch of molten lava cake had a flaky top after ten mins, so I baked for another two mins which made my cake gooey but the lava dint flow out :( It did taste wonderful though. I used baking milk chocolate (Lotus brand) for my cake. This chocolate is pretty sweet and lighter in shade. Hence my cake was not as dark as I expected it to be and was a little sweeter for my taste. 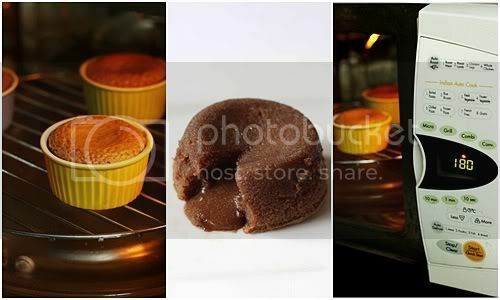 Love molten lava cake....looks super delcious...nice ramekins..whr did u get them from?? I just couldn't believe my eyes. I too made Molten lava Cakes yesterday. Never had the idea that we could transfer it to a plate. And as usual SUPERB SNAPS !!!!!!! 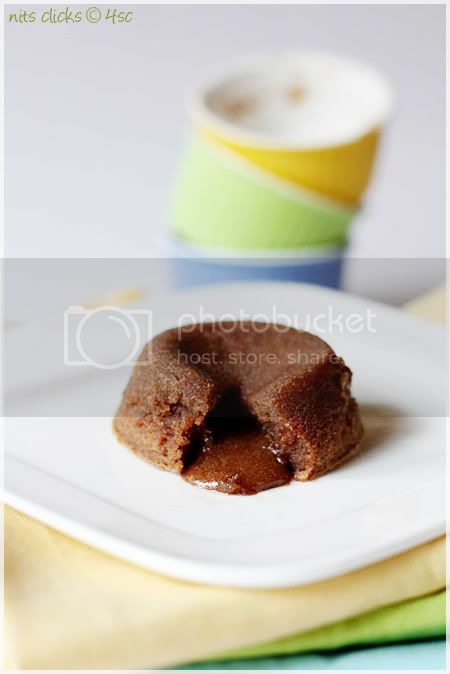 I love this molten lava cake even at midnight, very addictive and prefect dessert for chocoholic person like me..
looks delicious with flowing chocolate lava! Love this cake. Glad the kids are not around me right now else i would be driven to the kitchen to make these right now. Lovely clicks & yummy cake..
OMG! it looks amazing... I am droolling yaar.. Perfect and delicious dessert,yummy click. Lovey-dovey! 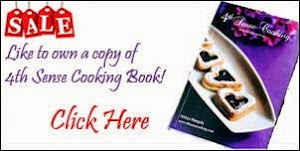 !this recipe gives perfect results every time! !Looks delicious..I've just got back to a regular dieting-walking routine and you are not helping one bit!! So from where did you get the ramekins finally?I got my set from Ratna stores,Treo brand,costing around 25rs/piece. 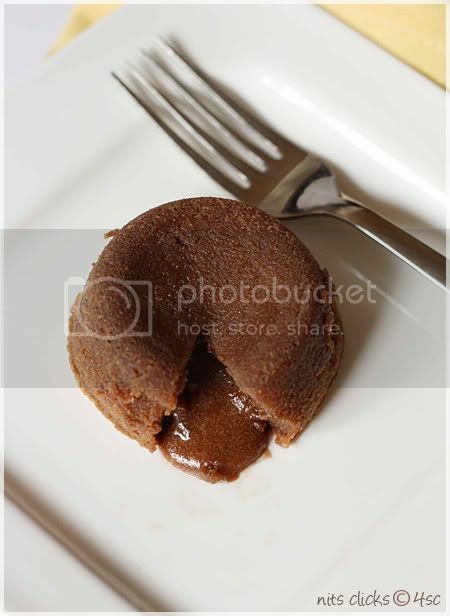 Nithya, tmolten lava cake have been my weakness always. I love them the most I should say of all chocolate cakes. Love your pictures as always. Simply mouthwatering cake dear. Looks awesome and love to indulge in it. Awesome cake and beautiful clicks. so cute cakes !! 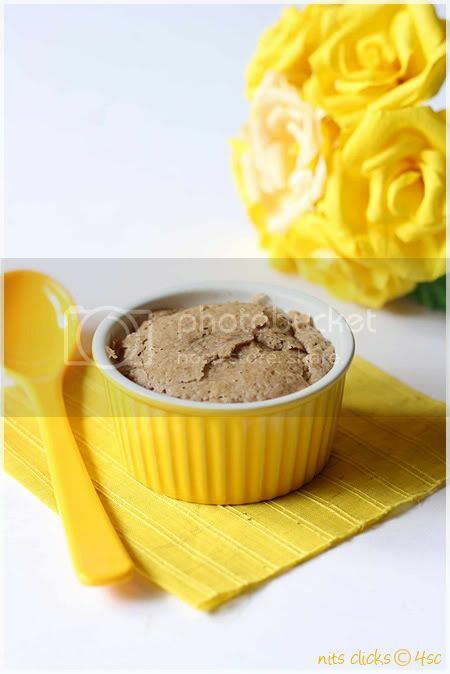 looks so yummy and wonderful clicks !! indeed not my piece of cake. The prep looks good Nithya. I like your passion to try new recipes and that too with perfection! The tiny bakes look lovely. Love love love this one a lot.. pictures is just making me drool Nithi. Hope everyone enjoyed this one.. This is on my to-do list from forever! I love the texture of your cake..nice! cupcakes in the oven looks wonderful and lighting is very special! I have the same question as above ... any substitute for egg here...? Vibhav and Nisha - I haven't tried eggless version of this cake but then you can give it a shot by replacing eggs by a tsp of cooking soda.